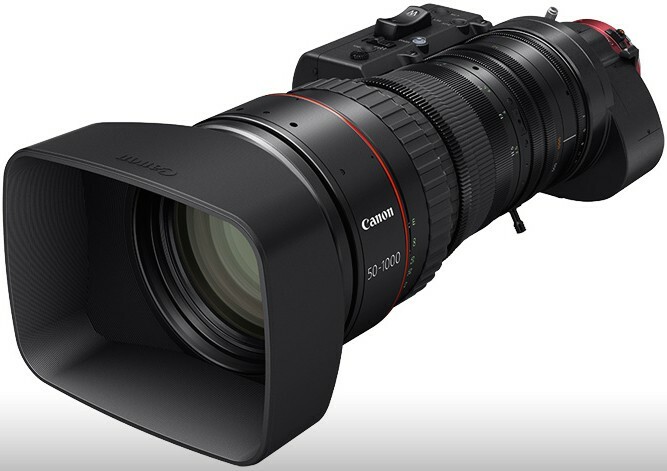 Canon has bolstered its cine-servo lens line-up with the new CN20x 50 IAS H E1/P1 high performance, ultra-telephoto zoom lens for sports and nature TV production. Delivering superb 4K image quality and exceptional creative control, the CN20x 50 IAS H E1/P1 is the first lens to combine a built-in 1.5x extender, class-leading 20x magnification and a removable servo drive, with a native 50-1000mm focal range that extends to a huge 75-1500mm. Designed for broadcast use with Super35mm cameras – whether HD, UHD or 4K – the CN20x 50 IAS H E1/P1 is a tool of unprecedented quality, versatility and usability. It features a completely removable, updated servo drive unit that enables its use in broadcast-style shooting environments where typical cine lenses are usually impractical. This lens uniquely combines broadcast operability with incredible accuracy, thus meeting the growing user-demand for Ultra High Definition (UHD) resolution sports and nature television production. The CN20x 50 IAS H E1/P1 features a removable servo drive unit and also supports 12-pin serial communication. Sports and nature TV productions are demanding and unpredictable, and these shooting environments demand huge levels of flexibility. For nature television, operators work in hostile and sensitive conditions which often necessitate shooting from extremely long distances, while sports productions typically require extremely high resolution for close-to-the-action stadium work. In both environments, operators require fast, reactive positional changes, shooting flexibility and nimble hardware that allow them to respond to changes in the scene. Portable and lightweight for its class – at around 6.6kg – the CN20x 50 IAS H E1/P1’s unrivalled focal length and zooming capabilities make it ideal for both environments. It enables sports and documentary crews to capture footage at distance, while maintaining the highest quality throughout the zoom range. The huge zoom range of the lens also significantly reduces the volume of hardware that crews are required to carry, offering a superb, single lens solution for location shoots. 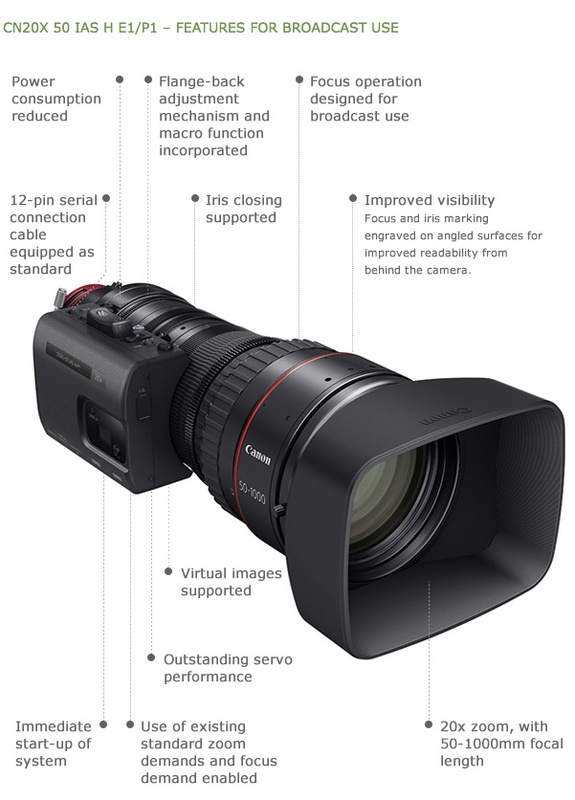 The latest in Canon’s cine-servo lens line-up, the CN20x 50 IAS H E1/P1 is also user-friendly, reliable and robust. The design has been developed to ensure high levels of ruggedness and reliability, even in unforgiving broadcast environments – combining the finest quality optics with a weatherproof and shockproof construction that makes it suitable for use in the most hostile conditions when on location, to the same level as conventional Canon broadcast lenses. Compatible with a wide range of cameras, the CN20x 50 IAS H E1/P1 also supports communication between lens and camera and will be available in both EF-mount and PL-mount variants. The EF-mount version utilises Canon’s own system, while the PL-mount variant supports Cooke’s /i Technology standard as well as 12-pin serial communication. The focus ring rotation is 180 degrees, thus balancing the accuracy required for 4K imaging with the speed needed for broadcast use. In scenarios where every second counts – and operators only have one opportunity to capture a shot – high speed zoom, iris and simple focusing operation mean that even rapidly changing scenes can be captured with ease and accuracy. Re-installation of the servo drive unit is quick and simple, with no adjustment of gear positions required. The lens’ front diameter is Φ136mm and it’s also colour-matched for easy integration with results from all Canon EF Cinema lenses. Canon’s renowned optical lens quality combines with support for industry-standard accessories, including matte boxes and 0.8- and 0.5-type gear module accessories such as follow focus units, to provide a truly versatile solution. The CN20x 50 IAS H E1/P1 is a superb lens that’s designed for broadcast use with Super35mm cameras – whether HD, UHD or 4K. It has unprecedented quality, versatility and usability and features a completely removable updated servo drive unit that enables its use in broadcast-style shooting environments where typical cine lenses are usually impractical. 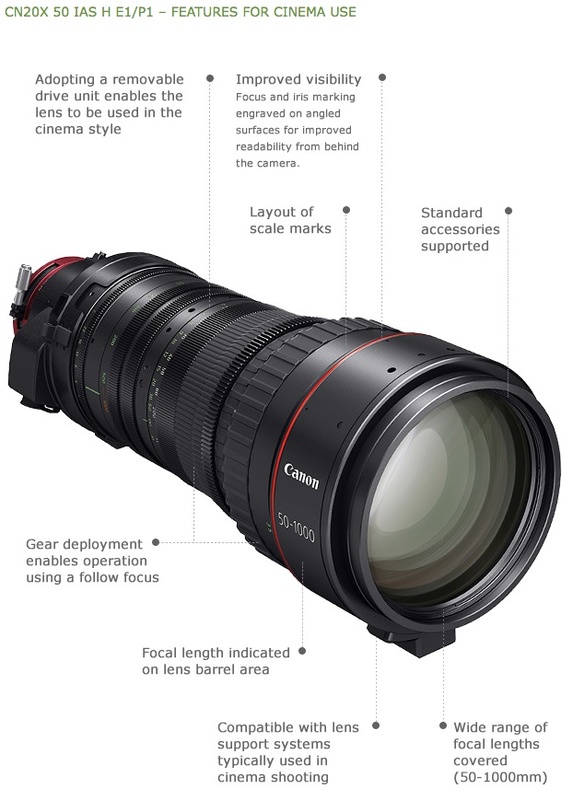 This lens offers a unique combination of broadcast operability and incredible accuracy, thus meeting the growing user-demand for Ultra High Definition (UHD) resolution sports and nature television production. It is highly flexible to meet the huge, and highly unpredictable, demands of sports productions that typically require extremely high resolution for close-to-the-action stadium work whilst, for nature TV productions, operators work in hostile and sensitive conditions that often necessitate shooting from extremely long distances. In both environments, operators require fast, reactive positional changes, shooting flexibility and nimble hardware that allow them to respond to changes in the scene. The CN20x 50 IAS H E1/P1 is perfectly suited to tripod-mounted use during studio or outside broadcasts, too. Zoom, focus and iris can all be controlled using Canon’s existing zoom and focus demands, providing precise and convenient control over vital image parameters without the operator touching the lens. Virtual studio use is also supported thanks to a sophisticated 16-bit encoder output.